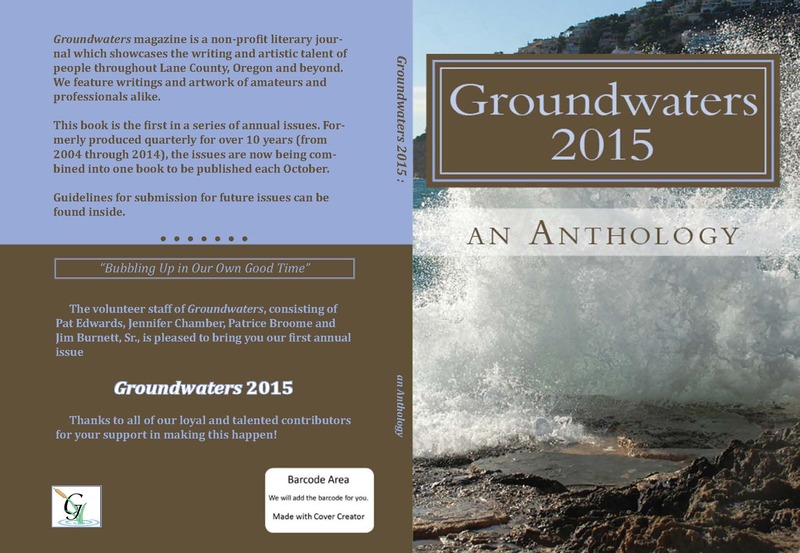 We at Groundwaters Publishing are pleased to announce that the first annual issue of Groundwaters — Groundwaters 2015: An Anthology is now available! It’s been a fun project and the 222-page book includes selections from an amazing 61 contributors! Check out the beautiful book cover and the list of contributors at the end of this message. Groundwaters had a wonderful turnout at our Groundwaters Live! Program held at the Fern Ridge Library last Tuesday to introduce our new “first annual issue” of the popular magazine. I’ll let Sandy Larsen tell you about it in the article that she is writing for the Fern Ridge Review, but if anyone is wanting to obtain a copy of the book, we are trying to set up distributors in the various areas around Lane County. It is now in the Farm Store in Veneta on Territorial Road and in the Lorane Family Store in Lorane. Hopefully, we’ll get someone set up to carry them in Cottage Grove and/or Creswell and Eugene, as well. In the meantime, contact me at edwards@groundwaterspublishing.com or paedwards42@yahoo.com if you would like to order a copy. They are $12 each. You can also order them on-line at our eStore. Jen Chambers and I had a fantastic time meeting and greeting some of our Groundwaters contributors who stopped by last night at the Songbrook Community Center to pick up their copies of our new Groundwaters 2015: an Anthology. We didn’t schedule a formal program… it was set up on a “drop-in” basis, but several of our guests, including Hoss Barker, Suzanne Twight-Alexander, Demetri Liontos, Tom Oroyan and John Henry) stayed and did some readings for the rest of us. Thank you to Lois Banks who arranged the venue for us in the beautiful Songbrook community room. It was the perfect setting with it’s comfy conversational seating, large round tables where we could all sit and visit and a kitchen where our snacks were easily accessible. It was a wonderful hour and half! We hope that this first annual issue will truly be the first of many and that we’ll see you at one of the distribution events.